We think we know everything. We believe that with the telescopes and satellites in orbit have everything in sight, we can see and know the whole universe, but the truth is that we have very little mapping. 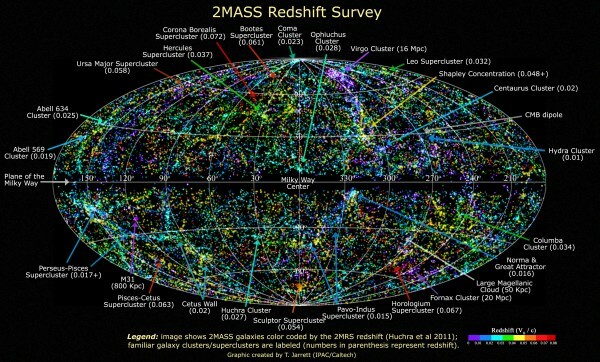 In the image mapping 50,000 galaxies that we see around us. Virtually everything has “gone to map” celestial, 0.1% of which are estimated to be. The celestial cartography is very complicated, mainly by a physical item called reference system. Universe, space, do not have a referral system. We have no source from which to start and 3 are the axis vectors. First, because the Earth rotates (you know) and then it further rotates in the Sun rotates in the galaxy … which makes difficult to have a reference system. To have a reference system needed 6 points in the fixed space and … there is no fixed point forever. Fortunately not all disadvantages. Earth, where we live, always has the same rate of rotation and rotation against our star we know to spare, so this consistency has greatly facilitated the stellar cartography. Therefore, to find a star in our sky have to indicate what day we see and latitude and longuitud where we are so that we can put the sky in the right place.